I caught a cold last weekend and have been suffering for a few days. This is the second time in my 5+ years of living in USA that a cold had defeated me. Last Tuesday and Wednesday were the worst. It felt very cold even in a well heated room and every inch of my body ached badly Wednesday. It reminded me of Napoleon’s invasion of Russia, known also as the Patriotic War of 1812. As the autumn came and the winter was not too far, instead of fighting in vain and losing many precious young lives, the Russian army extricated, people evacuated Moscow, even set the city ablaze to destroy any resource that might be found useful by the French. Soon a very cold and early winter came to torture Napoleon’s army. Despite Napoleon’s great quest of battles or negotiation to conclude the entire business as soon as possible, the Russians with mother Nature on their side did not need to confront their enemy directly. Weather was proven to be the most powerful weapon. Eventually Napoleon’s army exhausted with very little resource left, they were left with no choice but to retreat. History repeated itself again later last century. Feeling cold has a magical way of seducing me to think how those soldiers suffered for one man’s inflated and distorted ambition. As strong-willed as I am, I carried on laboring through the items on my to-do list until the afternoon of Wednesday. It came to the point that either I give in and lie down or I risk of making a fuss and embarrassing myself in the public. I chose to give in. I had Lustrum/Conspirata with me and its audio recording. Not sure exactly how the hours went by, I remember hearing Cicero pace up and down the Forum delivering speeches, reading about the many malicious and cunning plots against him, the many requests that Pompey demanded from the Senator, the new big house that Terentia loathed and so on. That night, it was unusually windy in this part of California. I was woken up multiple times by the violently gusty wind. In my dream which I can only recall pieces and bits as usual, the grand Roman houses were destroyed, the pillars of the Temple of Jupiter were falling down and thousands of people chanting “murderer” towards Cicero. It was more settling and peaceful to stay awake listening to the violent winds blowing than falling asleep and seeing how Cicero’s enemies crushing him and the Roman Republic fell into the hands of the Three Beasts (Pompey, Caesar and Crassus) together with their weapon Clodius who became immensely popular among the non-high-class public. 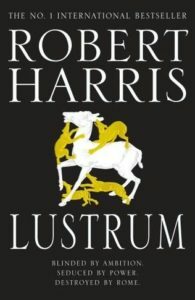 Following from the first book of Robert Harris’ Cicero trilogy, the second book Lustrum/Conspirata started with the beginning of Cicero’s consulship, went through many heart-wrenching twists and plots and power struggles, ended with Cicero’s exile from Rome, partially due to his enmity of Clodius, the lack of real support from Pompey and Caesar, partially thanks to Cicero’s very own moral judgement. As I was approaching the last number of pages of this 2nd book of Robert Harris’ Cicero trilogy. I felt disheartened and grieved for Cicero. I am not ashamed to admit that tears fell involuntarily. Here I was, sitting in the living room, wrapped with a long warm red coat with another layer of blanket on top, yet feeling freezingly cold and shivering in the bleak prospect for Cicero. Heartbroken as I was, I wish there is a magic way to rewrite history for Cicero. However, Cicero is not beyond reproach. His character had evolved from nearly all virtuous (in my view) in Imperium to a mixture of greed, shrewdness, justice, loyalty towards the Roman Republic, and high morality of distancing himself from misconducts in Lustrum. It is the contrast of Cicero’s character with others in the same settings that rendered him illustrious. After turning over the last page, looking back at the quote that the writer included at the beginning, it echoes much more profoundly than before reading the book. “We look on past ages with condescension, as a mere preparation for us… but what if we are only an after-glow of them?” – J. G. Farrell, The Siege of Krishnapur. Be careful of what questions you ask, for fear of what answers you may receive. During the trial of Murena, Cicero defended him and attacked Cato: “You say that the public interest led you to start these proceedings. I do not doubt it. But you slip up because you never stop to think. I am defending Lucius Murena not because of friendship, but for the sake of peace, quiet, unity, liberty, our self-preservation – in short the very lives of us all. Listen gentlemen (the jury), listen to a consul who spends all his days and nights in nonstop thinking about the republic. It is vital that there are two consuls in the state on the first day of January. Plans have been laid by men among us now to destroy the city, slaughter the citizens, and obliterate the name of Rome. I give you warning. My consulate is reaching its dying days. Don’t take from me the man whose vigilance should succeed mine. Do not remove the man to whom I wish to hand over the republic still intact, for him to defend against these deadly perils.” In Tiro’s words from Lustrum: Cicero’s delivery became more and more powerful as he went on, and I was reminded of some strong and graceful fish that had been tossed, apparently dead, back into the water – inert at first and belly-up; but then suddenly, on finding itself returned to its natural element, with a flick of its tail, it revives. In the same way Cicero gathered strength from the very act of speaking, and he finished to prolonged applause not only from the crowd but from the jury. The tricks of political campaigning that Clodius learned from Cicero: keep your speeches short, remember names, tell jokes, put on a show; above all, render an issue, however complex, into a story anyone can grasp. Mark my words, Tiro: all regimes, however popular or powerful, pass away eventually. I could not bear to watch, and yet at the same time it was impossible to tear one’s eyes away, for the ending of a great career is an awesome thing to behold, like the felling of a mighty tree. For a moment or two longer Lucullus remained upright. Then, very creakily, with joints stiff from years of military campaigning, he got down first on one knee and then on the other, and bowed his head to Caesar while the Senate looked on in silence. Cato listed out the fourth option for Cicero before Cicero had to exile from Rome: From the Stoic point of view, suicide has always been considered a logical act of defiance for a wise man. It is also your natural right to put an end to your anguish. And frankly it would set an example of resistance to tyranny that would stand for all time. I disagree with Cato’s words so strongly that I felt the urge of quoting him here. To my delight, Cicero did not take his advice. The dilemma returned: read the third book of the trilogy, partially for the sheer pleasure of enjoying Harris’ beautiful mastery of the English language and finding out what is next for Cicero, as one inner voice anxiously is pleading to me; “No, stop it! You know very well what would be the end of third book, The Roman Republic was turned into a dictatorship by Caesar who was then killed well-deservedly, followed by Cicero being murdered some time later.” another inner voice is shouting at me.